I’ve got one eye open as I take my first sip of my morning espresso. I unfold the Wall Street Journal (Oct. 12/13th 2013 edition) and start leafing through the pages when lo and behold I come upon an article that jolted me right out of my just-out-of-bed fog. Italians Lose Their Taste for Pasta. Say WHAT? Not this Italian (that would be ME). I start to read the article and I am aghast. Per l’amor di Dio (for the love of God) What the hell is this world coming to? 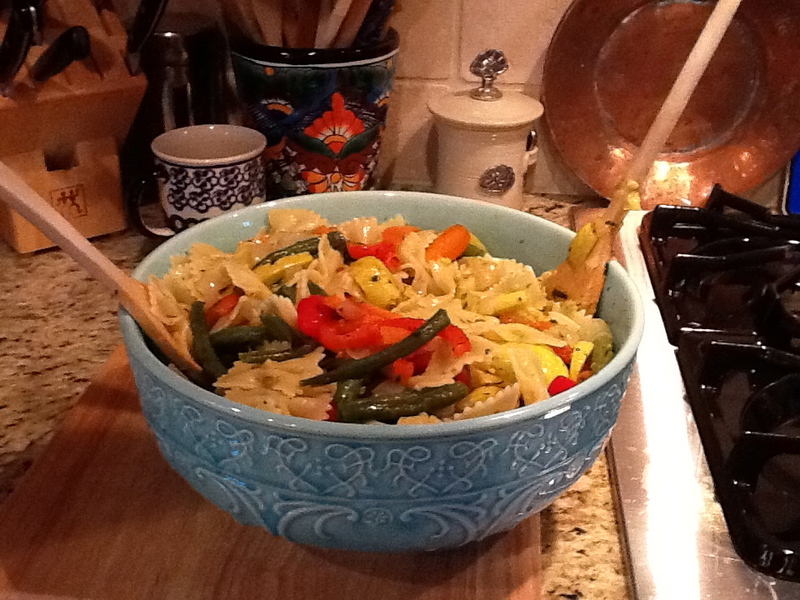 Pasta…my comfort food of choice. It seems that Italians are worried about the “fattening effects of pasta.” It also reports that Italian women increasingly view pasta as “boring and time-consuming.” Seriously? There are a thousand different ways to prepare pasta, how in the world could one ever view it as boring?! And time-consuming? Yes. If you make your own pasta but the majority of Italians don’t. 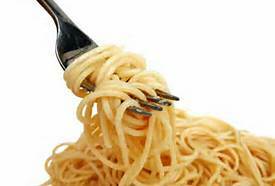 One woman weighed in saying that “Metabolism changes as you approach 40 so pasta is out of the question.” Yes. Metabolism indeed changes and at 56 I am keenly aware of this fact but to categorically dismiss pasta as out of the question is….well….sacrilegious! I’ll bet that woman isn’t even Italian! So what are Italians eating? Sushi! My Nonno and Nonna (grandparents) are no doubt rolling over in their graves. Yep. Sushi bars are exploding all over Italy. Chinese and Indian food restaurants are growing in popularity too. That explains that Chinese restaurant on my mother’s street in Udine and my cousin Paolo’s loathing of it since he must see it every single day. Harrumph. Don’t get me wrong. I love both cuisines…but this is Bella Italia people! My fondest childhood memories (and there weren’t many) took place on that street. My nonno Pio would walk me down the block of Via Pellicerrie to the local pub and order me an aranciata (orange drink) and a plate of polpette (fried meatballs) and he’d order birra (beer) or a Campari. My grandparents lived on a third floor flat in a building on the street, Via Pellicerrie 11. Her cousins (cousin Paolo still lives there) lived on the second floor and an uncle (my Nonno’s brother, Aldo) lived on the first floor. I was lucky enough to spend several summers in Italy, staying with my grandparents. Most mornings while mamma slept I’d take 50 lire (before euro’s) and steal downstairs out of the building on a mission to buy an apricot-filled brioche from the little shop just next door. I’d have to stick a rock in the door of the building’s entrance to prevent it from closing; I wouldn’t dare risk mamma’s wrath by waking her up with a doorbell ring. I wish I could remember the name of the owners of that little shop. They were so kind to me as I shyly stood at the counter nearly every morning and pointed to the confection in the glass case. “Ah, vuoi una brioche,” the sales woman would ask. “Oh, che piccianin! Si, cara…ecco…prendi (You want a brioche; Oh what a sweet little one! Yes dear…here…take it). I would say “grazie” in my small, hesitant voice, pay, and then scamper back up the three flights of stairs to my grandparents tiny galley kitchen. I’d sit at the little kitchen table and savor every morsel of that brioche along with a cup of caffè latte. It’s a wonderful memory…. And so are the abundant plates of pasta I enjoyed during those Italian vacations! I was a scrawny kid growing up. Having an Italian mom meant that pasta was a two-to-three times a week staple in our house. The pasta dishes we enjoyed growing up were simple, often incorporated seasonal vegetables or simply fresh tomatoes and basil and weren’t drowned in tons of heavy sauce or cream as is prevalent in the U.S. Mamma’s favorite to prepare was Spaghetti alla Carbonara but even that dish was prepared in the classic Roman fashion that did not include cream or tons of butter. When mamma was not well it was easy for me to prepare my favorite comfort food, spaghetti with butter, cracked black pepper, and Parmesan cheese. Years later my favorite comfort food would win over my finicky children every time. Pasta makers like Barilla are trying to respond to this “crisis” (my sentiment) by advertising that pasta is not fattening at “365 calories a portion” and it has a low glycemic count. Portion is the operative word here folks! And yes, while I’ll confess that I don’t eat as much pasta as I used to just three years ago, it’s because I can’t run anymore so I don’t need as much food…simple as that. Waistlines are growing all over the world and apparently Italy is no exception. But I’ll wager my meager life savings that it has nothing to do with the food that has been a staple of Italians since as early as the 12th century. It doesn’t take a PhD. to explain what’s going on here. Quite simply….people are moving less and eating more. My response to this disturbing trend? I renewed my subscription to La Cucina Italiana (http://lacucinaitalianamagazine.com/) just this morning. I refuse to dilute my heritage by skimping on the one food category that has given me countless wonderful memories! I will not cave to the reality of this slowing metabolism nor will I keep cutting out entire food groups in an effort to keep my waistline from expanding more. My war cry…..It’s pasta once a week! Life is short and too often it’s buried under a weight of toxicity in the form of sadness, angst, bitterness, anger and, well…you name it. Why add to all that negativity with more deprivation…less bliss? All it takes is a little portion control (and even leave some on the plate), moderation, and…most vital of all…keep the body moving by whatever means possible!